MLM Leads, The Good, The Bad, & The Ugly... What You Should Know BEFORE Spending A Dime Of Your Hard Earned Money On Network Marketing Leads. Here is what you need to know: There is no magical mlm lead source that will determine your success or failure in network marketing. A good mlm lead source will only ENHANCE the EFFICIENCY of someone who already knows how to work network marketing leads properly (using the strategies outlined in our FREE MLM Marketing Mastery Training Course). If you're not getting the results you would like from working your mlm leads, subscribe to the above famous newsletter now to learn how to become a recruiting dynamo using network marketing leads from ANY source. I've worked mlm leads from Cutting Edge, ProStep, OppSeekers, Fresh Interviews, Traffic Oasis, My Secret Leads, Leaders Club, and many, many other sources. The trick is finding the right mlm lead for the right type of approach. I use the strategies and tactics outlines in the MLM Marketing Mastery Training Course that allow me to generate my own personal mlm leads for free. If you have not subscribed yet, do it. Optimize ANY Leads with OptimizedMLMLeads. This is a fantastic service that I came across recently. How would you like to take any batch of mlm leads and know who the top 20% of achievers are, and who the bottom 80% are before you even pick up the phone? What if you could know before hand, who already has a track record of success in life? Who the leaders are? Who your TOP TIER leads are? How would you like to know who makes a middle upper-class income vs. the minimum wagers? If you are familiar with the 80/20 rule, you will immediately see the value of this service. Imagine purchasing inexpensive 30-60 day old network marketing leads by the 1000, optimizing them, and instantly knowing who the top 200 quality people/potential leaders are? How much time would that save you? How much money would that save you? INCREDIBLE SERVICE and HIGHLY recommended. P.S. This is a great way to test the mlm lead quality of different lead sources! See who provides the most Top Tier network marketing leads! For contacting mlm leads via phone, the best source out there is Fresh Interviews with their premium telephone verified mlm leads. The price is VERY reasonable and the quality of people are above average. I've found Joe Syverson's customer service and training to be top notch. Rating: ***** (5 Stars). For calling/email/postcards and working higher numbers, I recommend the network marketing lead packages from mlmleads.com. The primary advantage is that you get a lot of value for your dollar. Owner Enrique Garibay is known throughout the industry as one of the most trustworthy vendors out there. Rating: *** (3 Stars). For Live Leads: Cutting Edge Media is the oldest network marketing lead provider in the industry. Their primary mlm lead service is now the Home Business Match-Up Service which provides Live mlm leads. As soon as the prospects fills out the form, you are notified immediately so you can contact them fast. The problem is that you are one of 5 business owners who will be notified so there is some competition. This offsets the cost for you and helps widen their profit margin. I've found the quality of people in general to be medium to poor. Rating: ** (2 Stars). Email Broadcasting: NitroListBuilder is the only email service I know of today that will let you work 25,000-1,000,000+ mlm leads with an email broadcast service because of their exclusive partnership with 1ShoppingCart. If you have a killer email campaign that will drive prospects to a capture page, you can start building a massive opt-in list, and generate large numbers of live leads with this method. I personally use it for my Prospect Like A Pro MLM Training Newsletter. Rating: **** (4 Stars). Affiliate Leads Programs: I have mixed feelings about affiliate lead programs like Leaders Club, ProStep, and Traffic Oasis. I have used all 3 providers. The mlm lead quality is usually not very high, but what's the difference if your mlm leads are free once you have a few teammates using the service? If I had to choose one, I would go with Leader's Club. Rating: * (1 Stars). 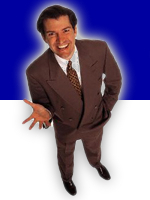 Copyright © 2003 - 2010 MLM Leads MLM Lead Leads MLM Network Marketing Leads Lead MLM Kee Solutions, Inc.